There is nothing better than holding your newborn baby close, smelling the top of their sweet head, planting a kiss on the soft downy fuzz, feeling their rose-petal skin against yours, hearing their gentle breathing as they melt into you. It’s bliss, and your baby feels it too. They are right where they want to be: close to you, the center of their world for so long, the anchor in this vast ocean of a world. But you have stuff to do – laundry to fold, food to make, dishes to do. How can you balance what your heart longs to do – be still and hold your little one close, and what you need to do as part of living – cooking, cleaning, moving around? The simplest answer, and one that countless of generations before us have learned, is to wear your baby. Baby carriers can be as simple as a long piece of cloth (wraps) to more structured carriers (commonly called Soft Structured Carriers or SSCs). There are many different styles and brands out there, and it’s hard to say “XYZ” is the best. It depends on the age of the child being worn, their size, the wearer’s size, and just their personal carrier style preference. I have found most people choose a carrier for the newborn-up to about 6 months range and another for the 6 months-up to toddlerhood/preschoolers. I am going to talk about newborn carriers and getting started wearing your little one from the beginning. Wearing your baby calms them down, regulates their breathing and their heart rate, and boosts their calm alert states. It also boosts milk production, increases bonding, and provides the wearer with a great low intensity workout with a weight that grows as your resistance builds. When you wear your baby, they are also participating in the world as you do. They learn language and verbal cues sooner. It also reduces the risk of Plagiocephaly or flat-head by getting babies up off their backs and by engaging their core and other muscles to hold themselves in space against gravity – the same ones that are engaged during tummy time.With any baby carrier, it is important that you follow a few safety guidelines. Always make sure that your baby is visible and kissable, that there is no fabric over baby’s face and you can see them. 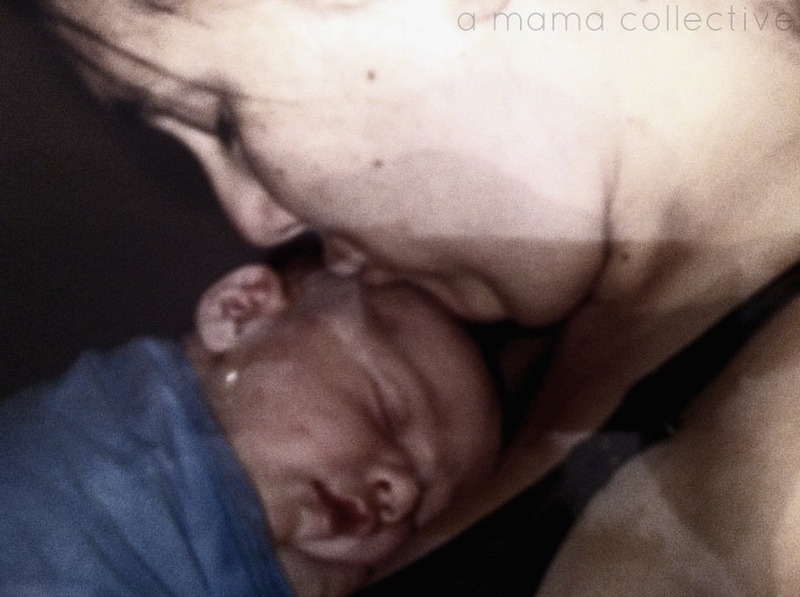 Baby should be tight and snug in the carrier; you want their chin to be lifted off the chest so you can get a finger and thumb between baby’s chin and chest. You need to make sure baby’s bottom is the lowest part of their body and baby’s bottom is lower than their knees – that they are in an ‘M’ shaped position (think of how you sit in a hammock). 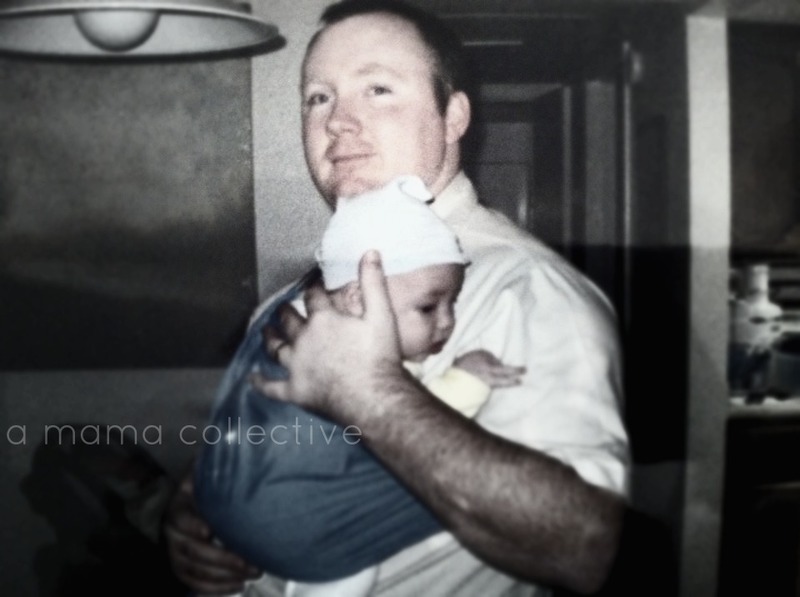 Use your common sense, check on baby often, and reposition if you feel they are not in a good position.The most common carrier styles used with newborns, I found, are ring slings and stretchy wraps. Ring Slings (RS) are one long piece of fabric with two metal rings sewn in at one end. You thread the fabric end through the rings – like the 80’s style belts (through both rings, then fold it back towards the rings and go over the first ring and under the second. This creates a ‘tail’). 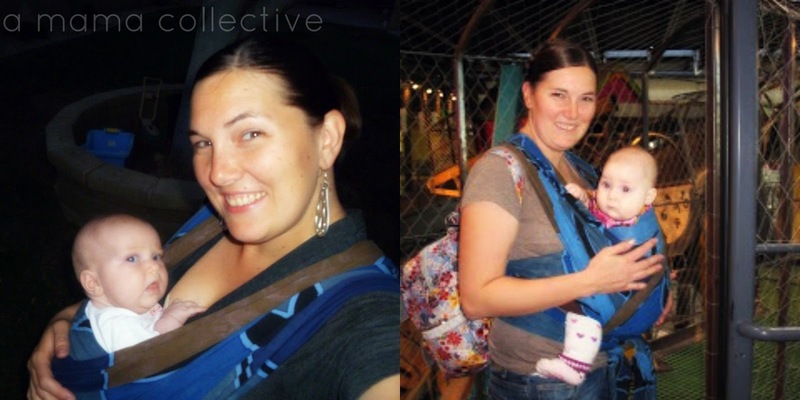 Ring slings are a simple, one shouldered carriers that are easy to adjust and have a low learning curve. These are one of my favorite carriers for the first couple weeks and for quick trips as baby gets bigger. They are very daddy-friendly too. Ring Slings can be worn in the tummy to tummy (T2T)/upright position on the wearer’s front, in a hip carry, in a back carry, and can be easy to nurse in and provide some discreet protection while doing so. Newborns and those infants under 4-6 months are worn in the upright position most of the time, unless nursing. These carriers, like I said, are easy to learn and quick to use. Their downside is that they will be less comfortable than other carrier styles for long periods of wearing as baby grows and gets heavier since all the weight is distributed only on one shoulder. Wraps can be split into two categories – stretchy/non-stretchy or woven. With new wearers, most will opt for a stretchy wrap. These can be pre-wrapped on the wearer so baby can be put in to the carrier and taken out without needing to remove the wrap or re-tie it. Wraps are usually considered the most comfortable and versatile of baby carriers. The most common newborn wrapping styles are the Pocket Wrap Cross Carry (PWCC) or the Front Wrap Cross Carry (FWCC). The PWCC allows you to completely wrap and tie the carrier on yourself prior to picking baby up. With this wrapping style, you can simply stretch the fabric around baby as you slide them in, or un-stretch it and wiggle them back out. You can use the PWCC to put the carrier on prior to leaving the house, then just pop baby in when you get to where you are going rather than lugging the infant car seat around. The FWCC is better as baby gets bigger or to get a truly snug fit with a stretchy wrap. Wraps are versatile and very comfortable when wrapped correctly, but they do have a higher learning curve. Don’t let that deter you! Most people find with just a couple practice runs, they end up loving using a wrap. It can seem overwhelming and hard to pick. How will you know what YOU like, what works for you? I highly recommend looking into finding a local babywearing group or small boutique that can assist you with carriers to try on or tips and tricks to using one you may already have.Babywearing International has chapters throughout the US, and they host free meetings in their areas. Many chapters have a lending library of carriers to play with and try on at meetings. This gives awesome exposure for newbies to any carriers.PAXbaby groups has a lots more info on groups in your area. Informal groups are listed on here as well as larger, more formal ones. There are several groups from outside the US on this listing. Check out TaiLeah's other guest posts on Cosleeping! Part 1: The Blissful Moments of Parenting and Part 2: The Nitty Gritty.